1) College of Medicine “J. Filaretova”, Medical University, Sofia, 2) Department of Anatomy and Histology, Medical University, Sofia, 3) Department of Forensic Medicine and Deontology, Medical University, Sofia, 4) Specialized Hospital for Rehabilitation - „Bankya” and „Sapareva Banya”, Sofia, Bulgaria. One of the most important symptoms in many nosological units in the past and present century is the arterial hypertension. It is a widespread symptom leading to very serious consequences, making it an important medical and social issue. In adults arterial hypertension registers within 8-18%, approximately 5% of cases with arterial hypertension is possible the cause not to be found. In these cases we speak of hypertension of unknown etiology. Key words: arterial hypertension, cerebrovascular disease, physical treatment. Krastev DS, Petcov I, Krastev N, Kalniev M, Apostolov A. TREATMENT OF ARTERIAL HYPERTENSION BY PHYSICAL METHODS. J of IMAB. 2013; 19(1):402-404. 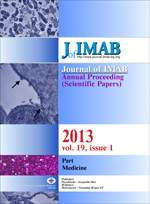 DOI: 10.5272/jimab.2013191.402. Correspondence to: Dimo S. Krastev, MD, PhD; College of Medicine "Jordanka Filaretova", Medical University - Sofia, Bulgaria. 9. Gottheiner V. Intensive physical training as after-care and prevention of myocardial infarct [in German] Internist (Berl). 1971 Jun;12(6):236-248. [PubMed].